The Obama birth certificate controversy concerns the birth certificate and place of birth of President Barack Obama. A 1991 publisher's biography used to promote the memoir Dreams From My Father states that Obama was born in Kenya. This bio remained in place until April 2007. During the 2008 presidential campaign, Sidney Blumenthal, an advisor to U.S. Senator Hillary Clinton, visited various media offices and asked them to investigate the Kenyan birth story. In response to an article published in National Review, Obama's campaign released a low-resolution image of the candidate's short-form certificate on June 12, 2008. 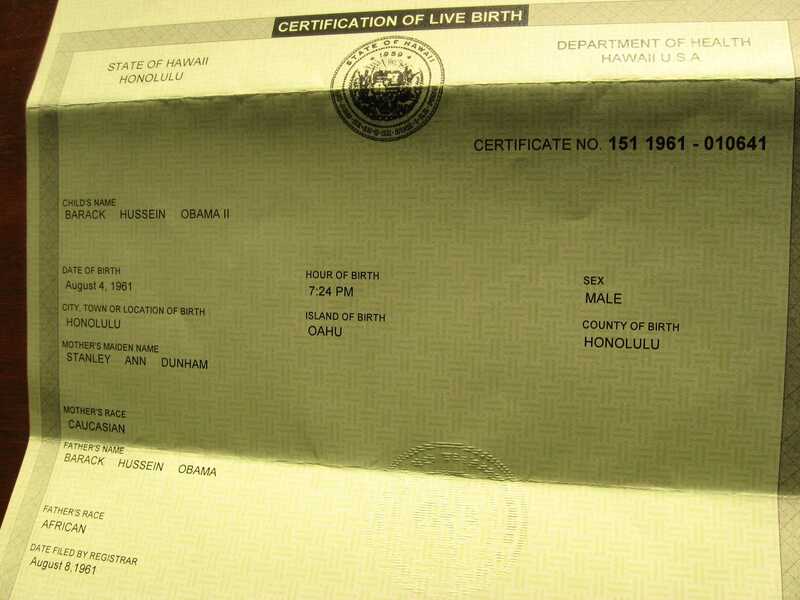 According to this certificate, Obama was born in Honolulu on August 4, 1961. As embossing and other security features are not visible in the image, it met with great skepticism. The skeptics soon developed into a "birther movement." Although a high-resolution image was released on August 21, the movement remained active, demanding that Obama release his long-form certificate. The White House finally released this document on April 27, 2011. The birther movement has contended Kenyan birth would make Obama ineligible to serve as president according to the United States Constitution. Others maintained otherwise. 3 What is "natural born"? With the news of Jerome Corsi's World Net Daily published book Where's the Birth Certificate? scheduled to be released on May 18, 2011 and with Donald Trump calling for Obama to release his long form birth certificate, it was finally released on April 27, 2011. Within days on its release it was being called a forgery. Despite efforts by people to downplay the reports of Adobe Illustrator layering and to explain them away, the anomalies on the birth certificate increased daily. The flawed forgery techniques were examined and re-examined by novices and experts alike. It would be hard for someone to explain the many multiple errors in the purported "authentic" birth certificate. Jerome Corsi said that he was alerted by a mole in the department of records in Hawaii, three weeks before the birth certificate was to be released, that a forged certificate suddenly appeared in the record book. Corsi and Farah of World Net Daily held back releasing the information because they wanted Obama to release a forgery and then prove that it was a fake which would be a crime. Despite the overwhelming bizarre and inaccurate information contained on the supposed birth certificate, the mainstream media and even some Conservative news outlets refuse to question the document's authenticity. Corsi stated during a radio interview on May 24, 2011 that a scanning expert is going to file a criminal complaint with the FBI that the birth certificate released by Obama is a bad forgery. Although the 1790 law has been repealed, it remains the only place in federal statute where the term "natural-born citizen" is defined. NPR Archive describes Obama as 'Kenyan-born' Also includes clips from newspapers from various African countries claiming Obama to be born in Kenya. Via WorldNetDaily. ↑ The biographical note says that Obama was, "Born in Kenya and raised in Indonesia and Hawaii”. Here is an image. ↑ Joondeph, Brian, "Obama Was the Original Birther", American Thinker, September 18, 2016. ↑ Geraghty, Jim (June 9, 2008). "Obama Could Debunk Some Rumors By Releasing His Birth Certificate", The Campaign Spot, National Review Online. ↑ Henig, Jess, "Born in the U.S.A.", Factcheck, August 21, 2008. Here is the image itself. 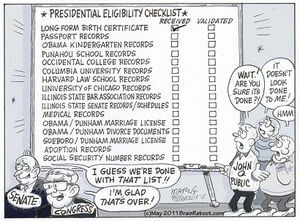 ↑ Obama's long form birth certificate. This page has been accessed 23,215 times.